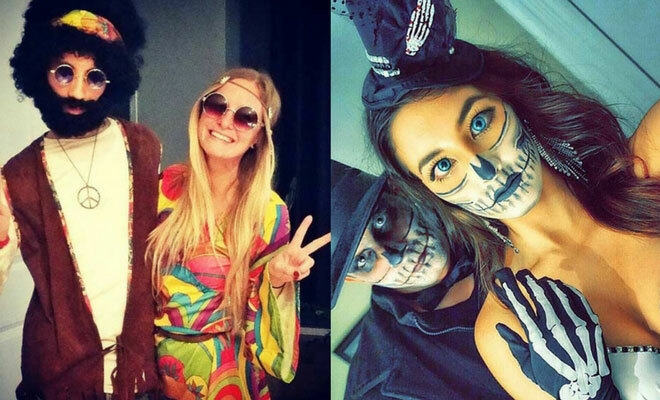 Let’s face it, it’s hard work trying to come up with a unique and original Halloween costume these days. Everyone seems to have done all the ‘classic’ characters already, and putting your own individual spin on the outfit as a whole has never been so important. 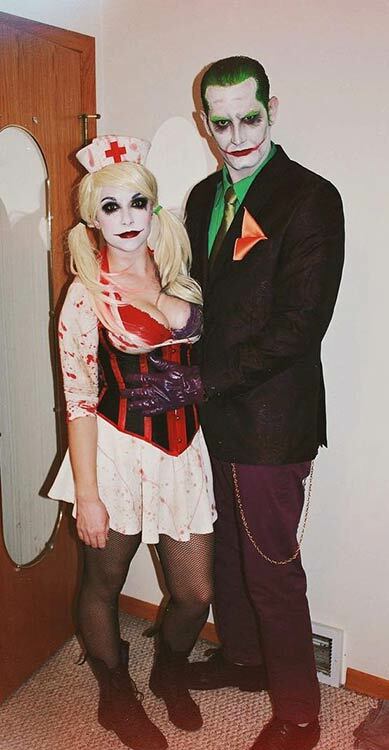 One thing you can do to ensure you definitely get it right this year is to look at DIY couples costumes for Halloween. Why wouldn’t you want your BAE to get in on all the action? It’s a little naughty for some, but with the assistance of some brightly coloured paper, some creative skills, and a boyfriend / significant other who doesn’t mind carrying a fake baseball bat and ‘bopping’ you with it from time to time, you could have amazing Mexican + Piñata DIY couples customers for Halloween. For a more exciting and scary twist, you could even add more graphic makeup to the mix – how about a ‘Day of the Dead’ type look? It’s the season to be scary after all. 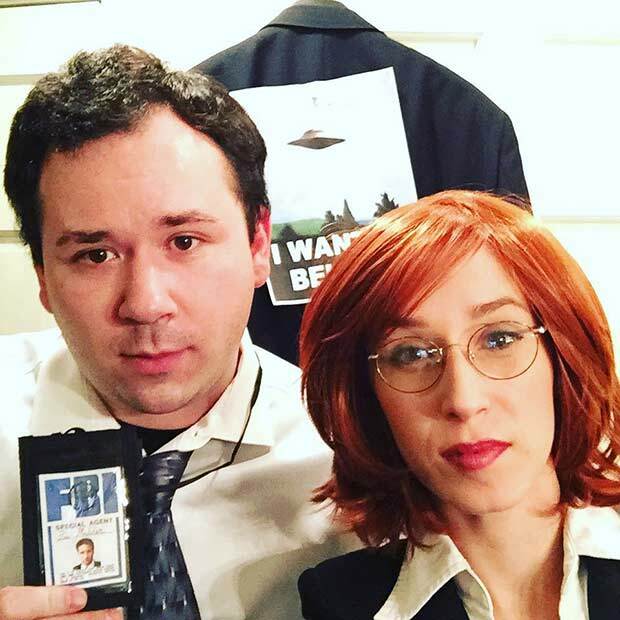 We loved the X-Files the first time around, and when Mulder and Scully came back to our screens again recently, we couldn’t help but jump for joy. In fact, when we’re talking all things supernatural and scary, you can’t go far wrong with a little bit of X-Files inspiration. What do you think? Could you and your significant other rock this for Halloween? It’s a simple one to achieve – you just need the right clothing choices. And a fake FBI badge … obviously. 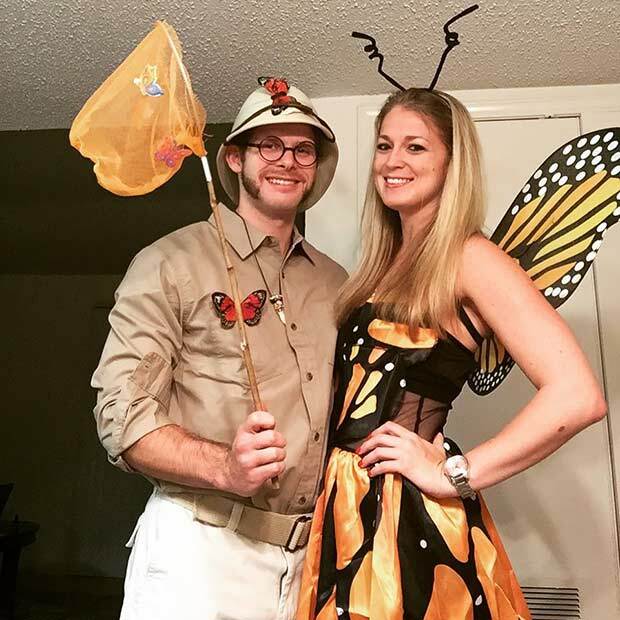 It’s hardly scary but there’s something very cute about DIY couples costumes for Halloween like this one – the butterfly and the butterfly catcher. It’s like the cutest look you could go for. He just needs the right hat, a net, and some beige coloured clothing to complete his look, and a bit of well-constructed facial hair seems to be a must, judging from this amazing costume. Her look is a simple butterfly costume, and you can get those from most fancy dress stores. It’s simple yet effective. Great for a last minute idea when all the other scary costume designs have been exhausted. 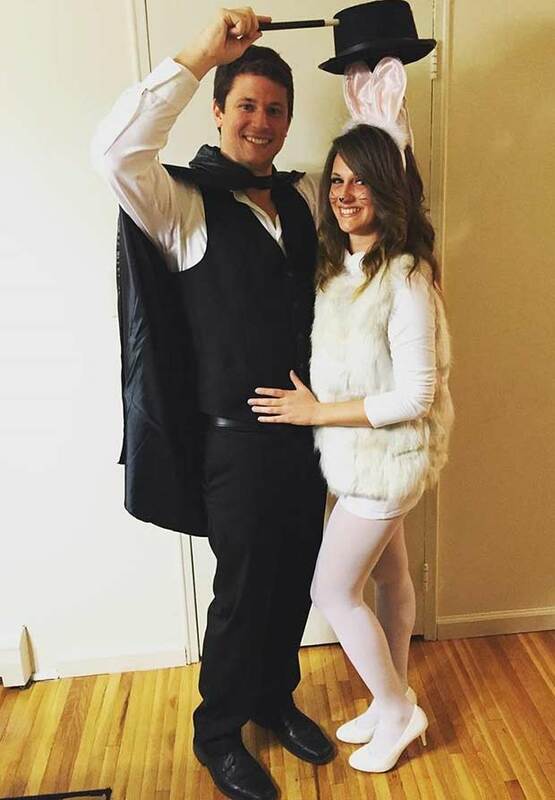 An age-old classic, the magician and the bunny rabbit is a great idea for a DIY couples costume for Halloween, and it’s actually not that difficult as long as you plan this one out in advance. If you want to get an actual costume from a fancy dress store, you may want to enquire in advance – the Halloween stuff will sell out long before the big day comes around! Thankfully, this couple have DIY’d it brilliantly. She’s wearing white leggings and a white tee, with a fluffy white waistcoat / body warmer over the top, and then a pair of bunny ears and some cute bunny-like makeup has been added to finish it all off. His look is a simple black suit – white shirt combo, with an added black waistcoat and top hat, and rather than wearing the jacket, a black cape has been added instead. You can buy these from most places for super cheap, especially online. Breaking Bad was such a huge hit all over the world, so it just makes sense to recreate the look for a good ol’ fancy dress part. 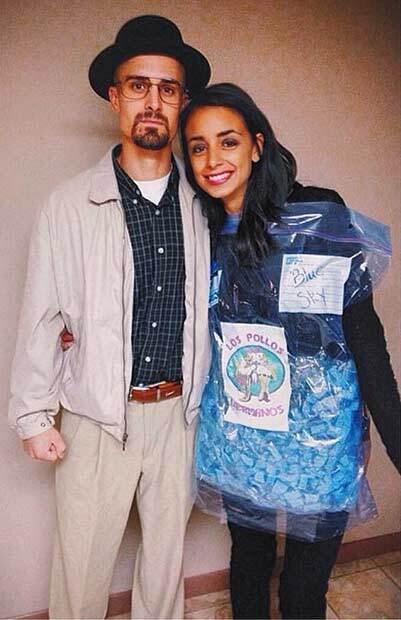 We love this – the idea of using Walter White and Blue Sky (otherwise known as the product made and sold by Heisenberg), as a DIY couples costume for Halloween. It’s all about the outfit and hat when it comes to Walter White, plus that brilliant facial hair too. If you’re trying to get your other half to dress up as him, encourage him to grow his beard soon! You’ll want to let him embrace his hairy side for this look. And for yours – a big zip lock bag filled with anything blue that looks like it could be Blue Sky. Genius idea, right? 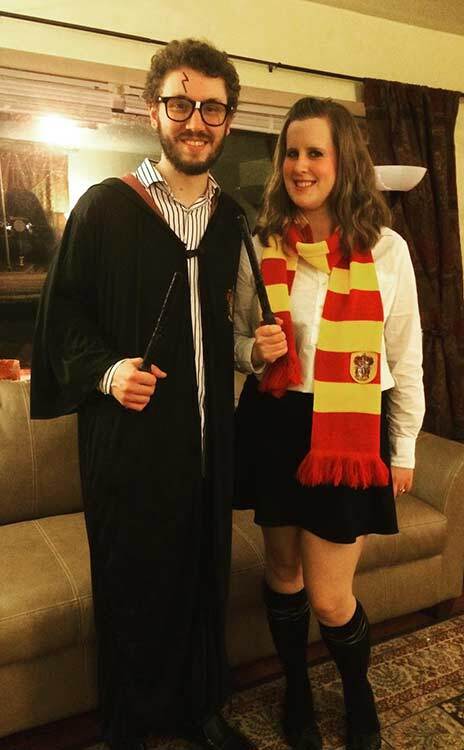 We think this DIY couples costume for Halloween is a simple genius idea – Harry Potter and Hermione, a look that’s definitely going to get people talking for all the right reasons. If you don’t have the chance to get your Halloween costume together nice and early, you can DIY this look with ease. She’s wearing a white shirt, black skirt, black knee-high socks and black shoes, and the Harry Potter scarf added around the neck just completes the look. For Harry, it’s all about the glasses. Add a striped shirt, black trousers, and a black cape (you’ll want to make sure you buy this in advance), and you have the perfect Harry Potter costume – wand not always necessary! There’s no way you can dress up as the dudes from Wayne’s World without singing Bohemian Rhapsody at least once, and according to Mike Myers, the film wouldn’t have gone ahead at all if that song hadn’t been in it. He threatened to walk if they took out the song. 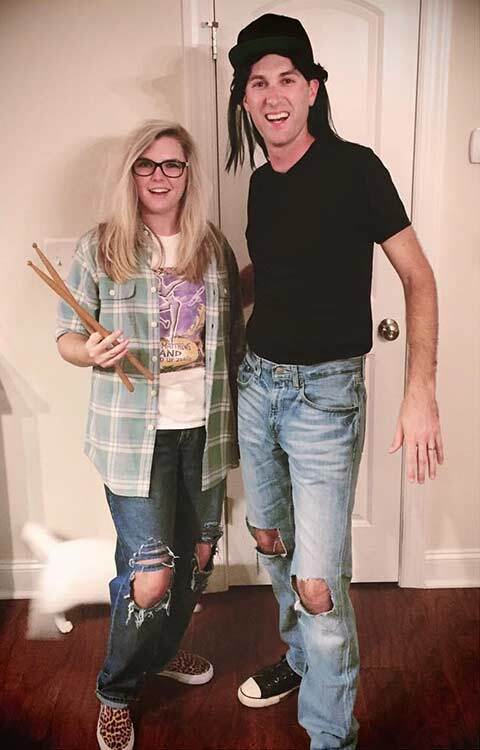 Coming back to Halloween 2016, and this Wayne’s World DIY couples costume for Halloween is easily replicated with some good old 80’s classics. Those jeans are a particular favourite, and don’t forget all about the wigs either! Suicide Squad was a massive hit this year, and whether you loved it or you hated it, you can’t deny that the Joker and Harley Quinn come together to create one of the best love stories ever. Admittedly he’s tried to kill her a lot over the years, but somehow they always manage to make it work … or do they? (Don’t worry, we won’t ruin the movie!) 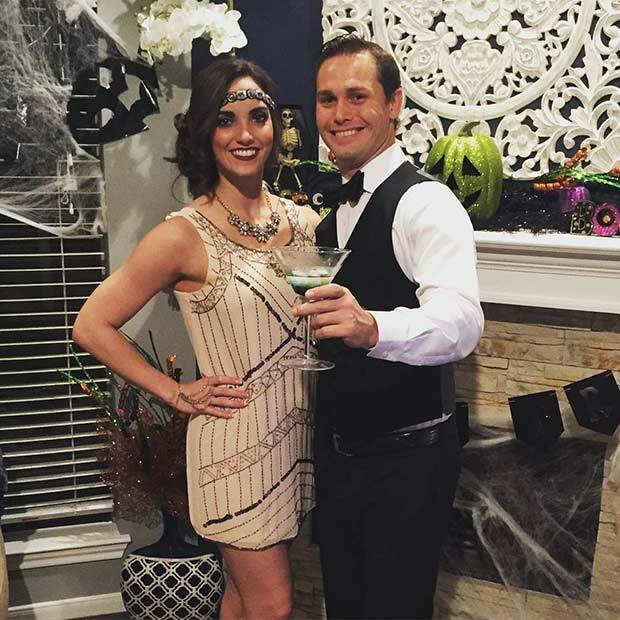 We think this couples costume for Halloween is genius, and great if you want to get a little creative! Who doesn’t love Ghostbusters, let’s be honest. 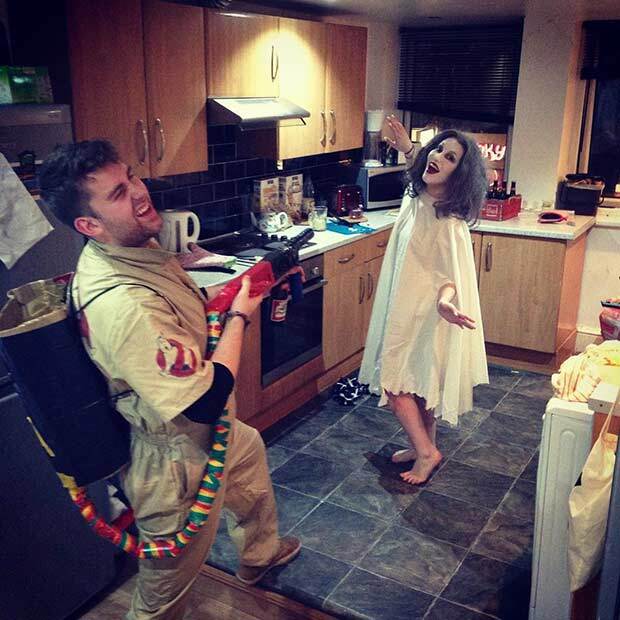 Although, to be fair, the new one was met by mixed reviews but we haven’t seen that yet so we couldn’t possibly comment… Let’s take things back to the eighties though, and dress up as our favourite Ghostbusters character, complete with ghost and ghost-gun! Brown coveralls could be used to recreate this look, and you can buy Ghostbusters patches if you don’t feel creative enough to come up with your own. Either way we love it. How about you?